There are really two keys to mastering any subject, including math facts or arithmetic – one is conceptual understanding and the other is sufficient practice. Let’s look at both aspects in a bit more detail. In the case of arithmetic, and before they can begin to master math facts, children need to conceptually understand the fundamental concepts of arithmetic. They need to be comfortable with the concepts of addition (adding to), subtraction (taking away), multiplication (adding multiple times) and division (sharing or dividing into multiple parts). MathRider supports this understanding of the concepts by providing visualisations of whatever operation is being examined. You can see the visualisations in the statistics screen and on the riding results screen. Simply click on a math fact, and the visual representation of the operation is shown. This helps to clarify in your child’s mind exactly *why* fifty-four divided by six is nine or why seven minus five is two. Please note: You do want to ensure that your child has a good grasp of what an operation such as addition means, before you let them master math facts using MathRider. Otherwise it may become “blind” memorization. The second key to mastering anything is to practice its application sufficiently. Some people take more and some less practice, but this is definitely the more time consuming of the two parts. 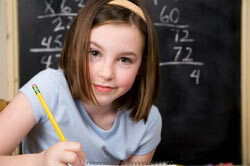 In the case of arithmetic, practice is crucial and is often not done in an amount sufficient for mastery. The reason is usually because kids find it boring to practice math fact after math fact. It is also hard to tell when exactly they are done. However, the consequences of insufficient practice are severe: lack of competence, loss of confidence and no way to succeed at higher level math. MathRider is specifically geared to address this. Also it solves the problem of knowing when there has been enough practice. To master math facts has never been easier. According to the latest research from Purdue University, repeated practice is the most effective way of learning and remembering material. Frequent repetition is key and MathRider uses repetition where it is most needed, and it recognizes when all facts have been mastered. Master math facts the fun and easy way! This entry was posted on Friday, February 11th, 2011 at 1:05 am	and is filed under CS, Education, Features. You can follow any responses to this entry through the RSS 2.0 feed. You can skip to the end and leave a response. Pinging is currently not allowed.